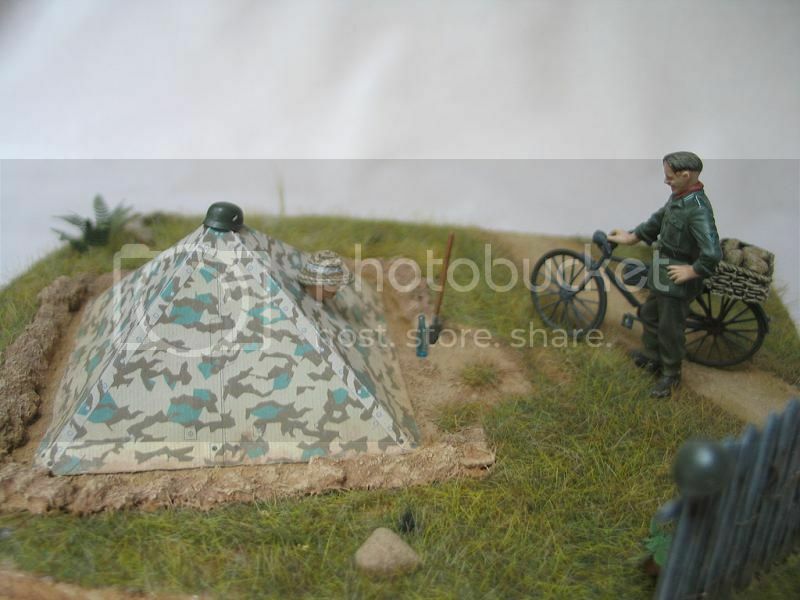 The World War II German Zeltbahn (ground tent) individual shelter quarter served both as a tent and as a poncho. It was made of highly water-repellent duck in the form of a triangle approximately 6 feet 3 inches along the base and 8 feet 3 inches along the other two sides. There were buttons and buttonholes on all three edges. The shelter quarter was covered with various camouflage patterns with some having different patterns on each side, greens on one side and browns on the other. Along with the Zeltbahn each soldier was issued two tent pins and one tent-pole section for use when the shelter quarter was made into a tent. Ordinarily four men put their sections together to make a small pyramidal tent. Other combinations were possible; the most common being eight and 16-man tents. The eight-man tent was constructed by erecting two three-sided pyramids and buttoning an inverted shelter half in the space between them. The 16-man tent was made by joining four of the long sides of the eight-man tent. A regular, four-section, pyramidal tent was erected on this base. The tent stood over 9 feet high. When worn as a poncho, the shelter quarter provided good protection from rain because of its excellent water-repellent property. The soldier's head was inserted through a slit with the narrow point of the triangle in front. The two rear points were brought forward and buttoned together. Slits were left open for the arms, where the poncho draped like sleeves. Motorcyclists and bicyclists could also fasten the shelter quarter around the thighs to cover and offer protection for their legs. 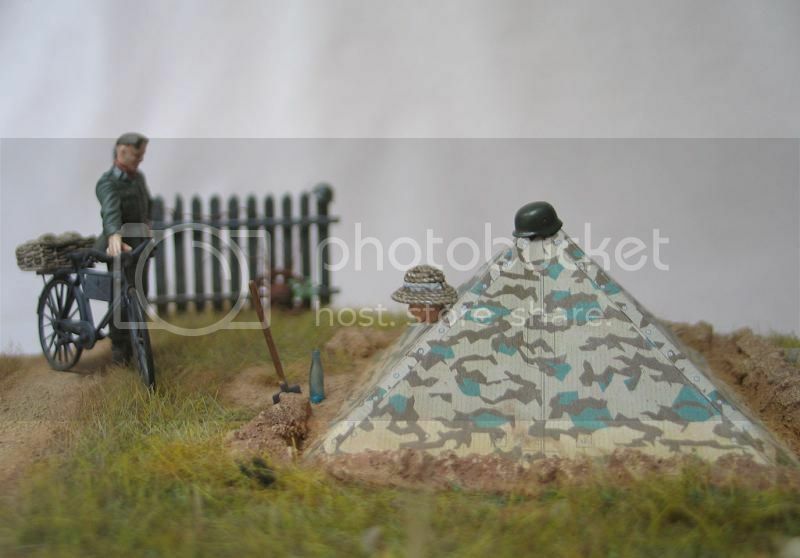 Medico’s D-tails has released WW2 German Army Zeltbahn 31 tent, summer side, number 010, in 1/35 scale in their diorama accessories series and it comes as a single tent which represents four separate German shelter quarters that have combined to form a four-man tent during World War II. The kit comes in Splittertarnmuster or Splittertarn (splinter-pattern) Buntfarbenaufdruck 31 camouflage pattern which was a four-color military camouflage pattern developed by Germany. The pattern consists of a disruptive, zig-zag pattern of hard-edged wood-brown and medium green polygons printed on a light field-grey or tan background. A random pattern of green dashes, called "raindrops", was applied in places to improve the camouflage effect. 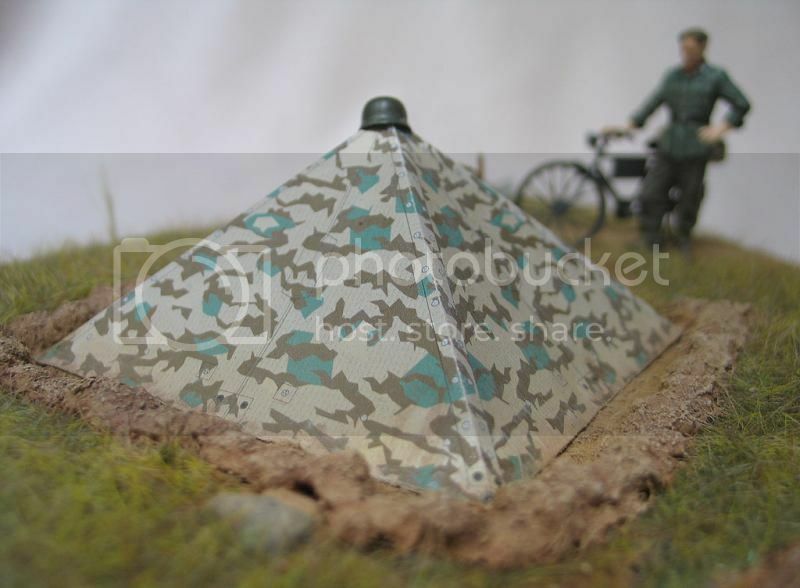 The camouflage pattern is only printed on one side which will limit the uses of the tent as it will only be able to be displayed in the buttoned up position. Personally I would have liked to have seen the pattern printed on both sides of the sheet as it would have given the modeler several options to choose from to create a realistic display. One detail of the tent that I like is that not all four represented shelter quarters are the exact same color. Two of them have a slightly faded color which helps create a more realistic appearance by showing different ages/weathering of the quarters as would have been seen in real life. Included with the kit as well is an historical, technical leaflet which gives a brief history of the Zeltbahn as well as details of how the Zeltbahn was used in various configurations such as in the images provided on the sheet. This was a nice addition as it will help the experienced modeler as well as the beginning modeler unfamiliar with this particular piece of German equipment. The instruction sheet included in the kit is a single page basic assembly guide including, where to cut, which holes need to be punched out, folding instructions and which type of glue to use. Medico’s D-tails recommends PVA glue. The sheet also describes how to use toothpicks to represent tents poles and how to place them as well as how to use a 5:1 mixture of PVA glue and water to brush over the tent to give it detail and a weathered look. The kit comes sealed within a clear re-sealable plastic bag which contains the single paper sheet kit itself as well as the instruction sheet and a sheet that contains a history of the Zeltbahn 31 with images and descriptions of different uses of the shelter quarter. The assembly is very straight forward and is very easy to understand. The tent needs to be cut from the sheet. I used a metal ruler and an X-Acto knife to remove my sample from the sheet however scissors could be used as well if so desired. Once removed he shelter is easy to fold into the correct shape. I again used my metal ruler to make the folds on the lines pointed out on the instruction sheet. 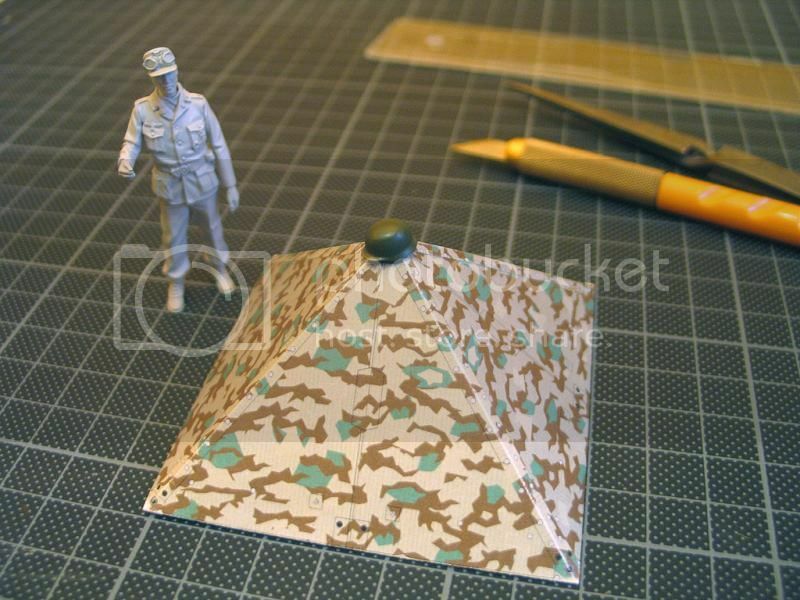 Due to the tent only having the camouflage pattern printed on one side I would recommend gluing the ends together to represent a buttoned up shelter. If so desired the modeler can punch out the holes pointed out in the instruction sheet and add thread to them to represent the actual rope that was used in the construction of the actual item. I did not do this myself however it would be fairly easy and straight forward to do so. Scale tent poles would be easy to create as well using toothpicks or small wooden dowels. Being made of wood they would give an extra touch of realism to the completed tent. The slits used as “head holes” could be cut open as well if so desired. The completed shelter measures 2 ¾ inches wide at the base on all four sides and approximately 1 1/2 inches high. I placed a 1/35 scale German figure in one of the picture for scale comparison. 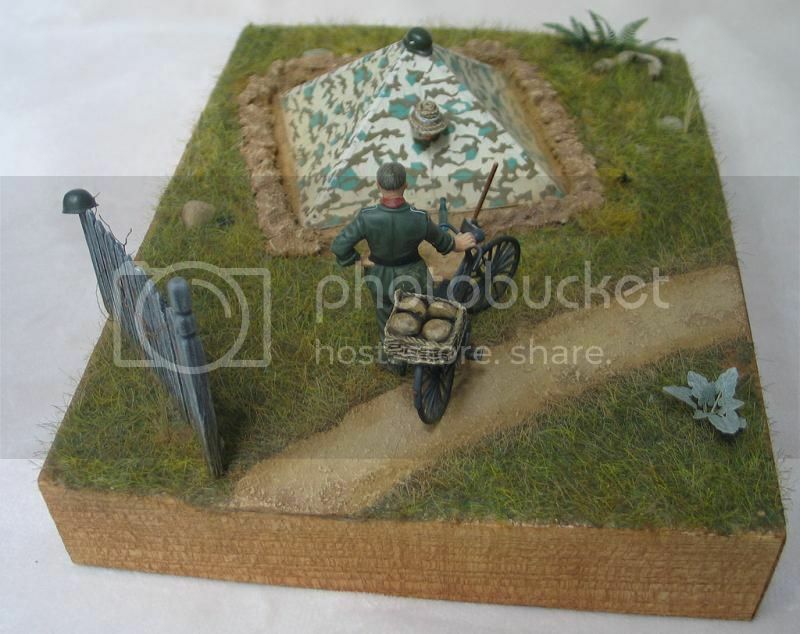 The completed shelter could easily be used in a diorama or vignette setting without much work other than some scratch-built details and some weathering. This was a very easy item to assemble and took very little time to do so. Thanks to Medico’s D-tails for the review sample. Please be sure to mention that you saw the kit reviewed here when ordering. All in all this is a nice representation of the German Zeltbahn 31. I was impressed with the detailing on such a simple item. With scratch-built tent poles and tent stakes as well as some appropriate sized thread to represent rope it would be very easy to detail this shelter. I like the kit and I feel that anyone who purchases it will be pleased as well. I would have no hesitation to recommend this kit to others. My only disappointment in the kit is the fact that the camouflage pattern is only printed on one side limiting the options of how the tent can be displayed. Lows: The camouflage pattern is only printed on one side. Verdict: This is a nice paper kit which represents a World War II German Zeltbahn 31 in Splittertarn Buntfarbenaufdruck 31 camouflage, summer side out. Our Thanks to Medico's D-tails! Well...since it's a paper cut out product, and printed only on one side, it might prove to be a little difficult and a little impractical to do so. I suppose you could try soaking it in diluted white glue and then draping and shaping it over a figure. But then, you also might just end up with a soggy mess! That's funny! In the present review pics of a folded up Zeltbahn tent, the interior clearly shows that the product is only printed on one side (the outside). Ah, but the ones presently being discussed are by Medico D-tails, not J's Works. Be cool, man. Yes...I know....it's my review...but you quoted what I said about the J's Works shelter quarters. So I just don't know where you were going with your comment. Sorry about that! I thought you were talking about the Medico ones. I have seen a number of those tents (big packages and small ones) and it comes handy compared to painting the stuff yourself. I haven't tried it myself to soak tent and wrap it around a figure, but i was considering that option. As i mentioned early, this is how it looks like when it is applied. 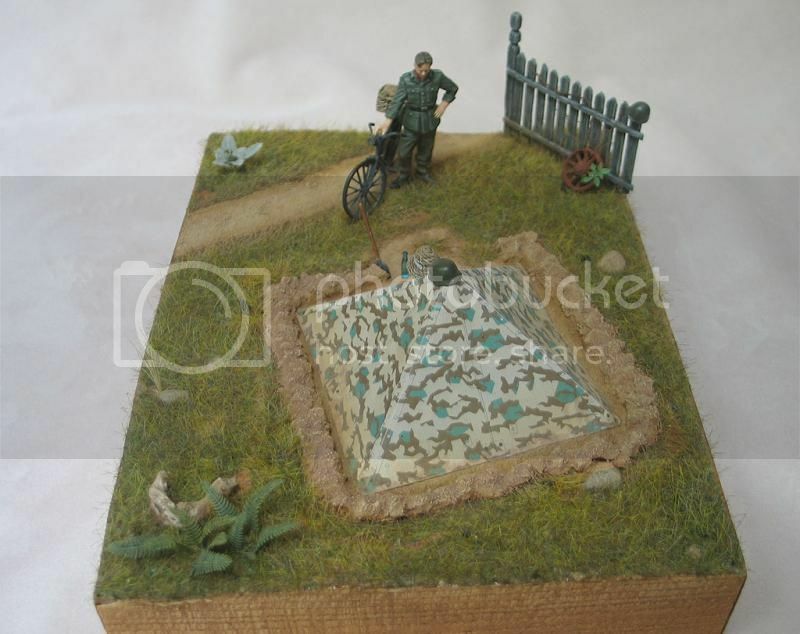 There are several images of small vignette in progress. If i had a female head, the dialogue would have been (as in Apocalypse now) "who are you?" "i am the next"